The campus quad turned into a carnival yesterday afternoon as students leaped across a giant bounce house, tossed ping pong balls and competed in a human foosball tournament. The 3rd Annual Kickoff, hosted by Associated Students Inc. (ASI), catapulted SF State into the new academic year and publicized the campus merger. Students cheered for the highlight of the event, the human foosball tournament. In it, several teams competed for the “golden shoe,” a gold tinted sneaker. 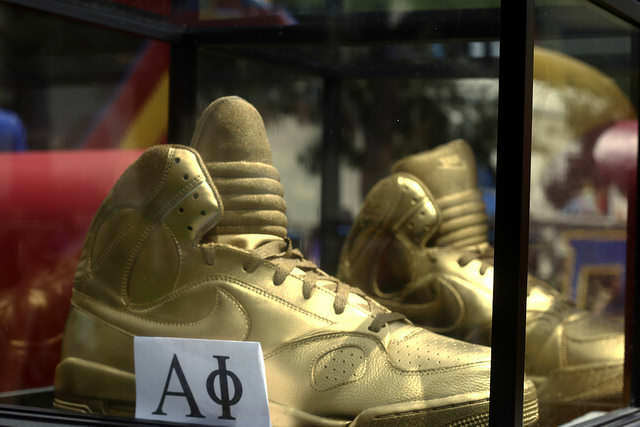 [/media-credit] Golden shoes sit in a glass box at The 3rd Annual Kick Off presented by ASI held the event at Cesar Chavez Plaza at SF State Thursday, September 4, 2014 in San Francisco. “We are really happy,”said Luis De Paz, the ethnic studies representative for ASI and coach for Hermanos Unidos, after his team received the tennis shoes. Hermanos Unidos, which is a campus fraternity, managed to defeat five other teams with a total of fifteen goals, according to De Paz. “It was a fun event. Now that we won, we have bragging rights,” added De Paz. Last year, sisters of the Alpha Phi, a national student sorority, won the obstacle course race and a pop culture trivia quiz to declare victory of the golden shoe, according to Erin Nalei, a member of Alpha Phi. In addition to the “golden shoe,” ASI raffled off $500 worth of prizes, among them a GoPro camera, which will be announced to a winner next week, according to Cesar Vasquez, the marketing manager for ASI. In addition to the fun and games, the event also served to inform students about new changes to the campus. “This is a publicity event to welcome back students and promote the merger between ASI and the Student Center,” said Raul Amaya, the interim director for ASI, describing the purpose of the kickoff. ASI representatives remained behind an information table to tell students about the kick off and the merger and hand out USB drives with a promotional video. After a lease between the University and the Cesar Chavez Student Center terminated in July, the alternative has been to combine the Student Governing Board (also known as Associated Students) and the Student Center Governing Board, explained Amaya. “Now is the time to ask the students for permission,” said Amaya, adding that students will have an opportunity to vote on the merger at the end of the month. Still, some students seemed to gravitate toward the free food, games and general festive atmosphere of the event, while going unaware about the merger. “If the purpose of the event was to inform students about the merger, then it didn’t work,” said junior Jennifer Albee, who didn’t know about the vote despite visiting the ASI table. The campus student body will vote on the merger at the end of the month, from Sept. 30 through Oct. 1.